The first type under this category is built-up roofing, one of the oldest and most reliable types of roofs. 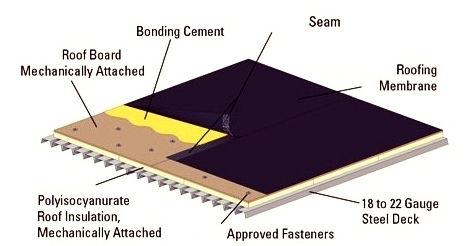 It consists of several plies of roof felt laminated in hot asphalt. It’s surfaced with gravel set in a flood coat of asphalt. Modified roofing, on the other hand, usually has two plies of roof felt laminated in warm asphalt but with a cap sheet covered in ceramic granules. The EPDM is one of the most common types of flat roofing materials, thanks to its affordability and ease of installation. It is also odor-free, unlike built-up roofing systems. EPDM roofs can be fully adhered, mechanically fastened, and loose-laid. Other types of the single-ply systems include TPO and PVC. Lastly, there is a complete product lineup of coating systems that can be applied to any type of existing roof surface. The coats form an impermeable membrane over the roof’s surface. They also have a reflective white surface that can help save energy. Greenawalt Roofing Company offers exceptional products and services that meet the highest standards of the industry. Our team ensures flawless installation of your new roofing system. Choose from our wide range of options, from asphalt shingles to low-slope roofs. Call us at (717) 898-6000 to schedule a free roof replacement estimate. We serve Lancaster, PA and the surrounding areas.